Who'd have thought that your young one would end up leading a life of piracy, and at such a tender age, too? Why, there's no telling what sort of things your toddler will be up too as a pirate! He'll be searching for buried treasure in the backyard, drawing treasure maps with crayons and looting the cookie jar when no one's looking. But sometimes, you just got to let your kid live their dream of being the greatest buccaneer on the high seas. In fact, it's about time you did something to help your child be the best pirate out there! It's time you outfitted your little one like a real buccaneer. After all, if he's going to rise to the rank of captain, then he's going to need a pirate outfit that lets his crew know that he means business. This toddler Pirate Ahoy Matey costume is exactly the kind of outfit he needs. 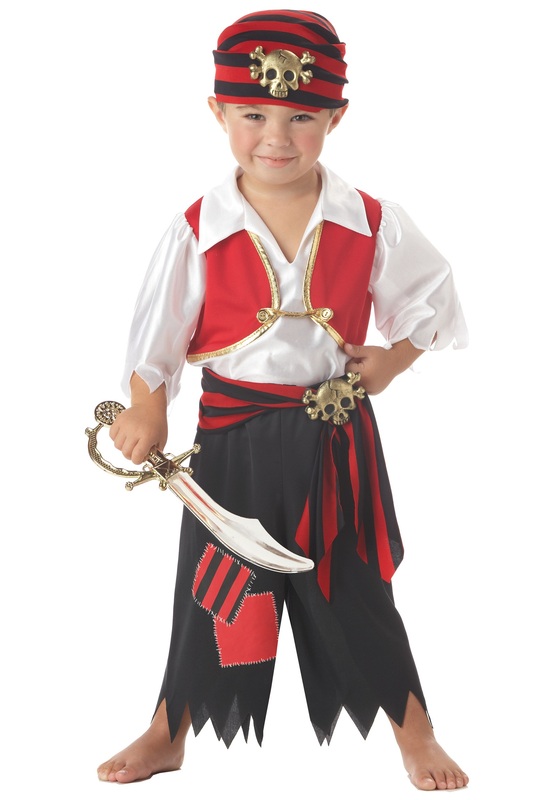 With a white swashbuckler shirt and a red vest with gold edging for added flair, this costume is one part adorable and one part pirate. The bandana has a gold skull emblem on the front to let the crew that he's one tough customer and he's out to get all loot he can get his hands on! Of course, there's nothing stopping you from joining your kid on his high seas adventures. We carry plenty of adult pirate costumes to go along with this toddler one, so you can suit up as your little one's first mate for a spot of treasure hunting!